Sue Thompson, our new Farm Discovery Coordinator in Northumberland, led the St. John’s Church Sunday School on 7th October with a lively lesson based around the story of wheat. 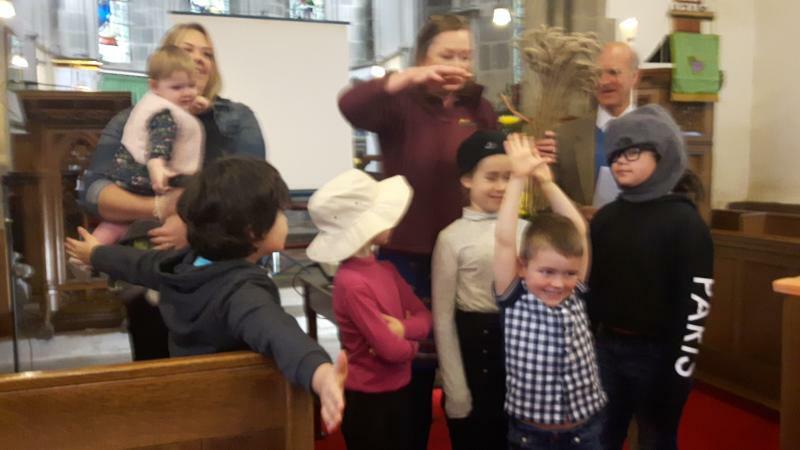 With the children wearing farmers’ hats to indicate the weather in different seasons, they acted out the growth of a wheat seed from germination to harvest, and then led the audience in creating a ‘congregation combine’ with actions and noises. The children were thrilled to see the journey from seed to flour, and on to bread and finally to the toast they have for breakfast. The congregation were all laughing and enjoying the fun and joy, but understanding the message that our farmers work in partnership with the gifts of sunshine and rain, and work so hard to make food for us to eat. Sue and the children were kindly assisted by Mr David Martell, of nearby Black Hedley farm, who was plucked from the congregation after raising his hand in response to the question, “Are there any farmers here?” We hope he dares come back! Afterwards, Sue gave a passionate presentation to an audience of over fifty, about her experiences of seeing awe and wonder of our rural world seen by disadvantaged children she has met so far in her new role. She explained the mission of the Country Trust, to provide high quality educational experiences to children least able to access the countryside and how their lives can be changed because of their visits to working farms, residential visits and the Food Discovery programme that teaches growing, cooking and enterprise to the poorest of our children. There was an auction of flowers, produce, jams and cakes which raised over £80 for the Country Trust, and later during their shared lunch, some individuals thrust envelopes and notes into her pocket after telling her how her talk had made them feel, and how emotional they felt. Many said they were amazed at the extent of child poverty so close to home, right under their noses, and had not realised the impact of a day in the countryside for children who may never leave the street they live in. We are so grateful to the community of St. John’s Church, Snods Edge near Shotley Bridge.